Wednesday 2nd November saw the official opening of the new Pwll Play Area by Llanelli Rural Council Chairman, Councillor Steve Donoghue. The play area, situated next to Pwll Pavilion is the result of a community asset transfer between Carmarthenshire County Council and its new land owners, Llanelli Rural Council. 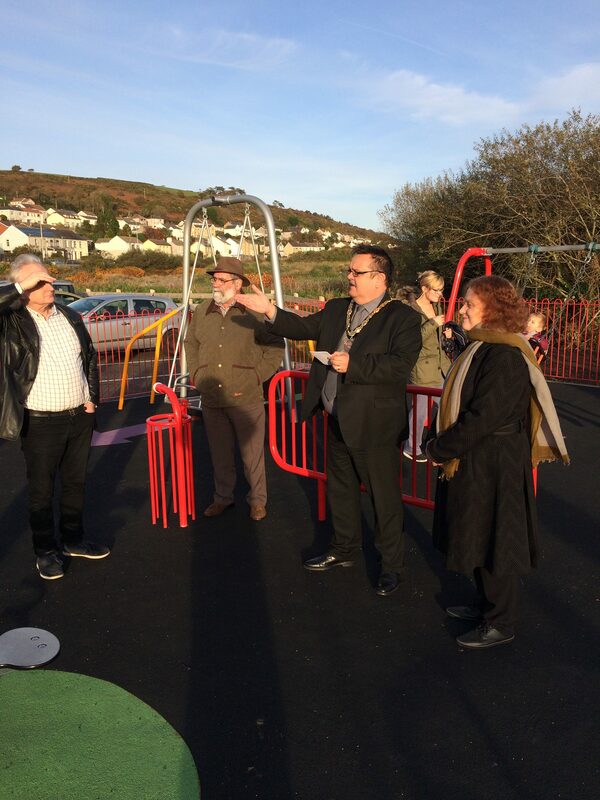 The play area completes the regeneration of the Pwll Pavilion area which has improved access from the main road and has created a new car park. The final design of the play area was a result of two public consultations held at Pwll School during November 2015 and May this year. The information gathered at these events is reflected in the final play area where there is the provision of wheelchair friendly equipment such as a swing, roundabout and picnic table. The popular new play area, funded by Llanelli Rural Council, has replaced one of the two tennis courts at Pwll recreation grounds. It has been very well used by the local community and visitors to the Millenium Coastal Path and Pwll Cafe since the play area opened in late August.